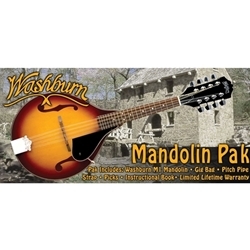 The Washburn M1K Mandolin package comes with exactly what you need to start playing the mandolin. Washburn includes the M1 mandolin, a gig bag, strap, picks, a pitch pipe and a mandolin lesson book in this outstanding deal. Expand your sonic palette with the distinctive flavor that only a mandolin can add! From Dreadnought to folk, 6 string to 12 string, rock to classical, and from banjo to mandolin, each instrument will provide years of playing enjoyment and the pride of owning a Washburn. These traditional favorites all adhere to Washburn's standard of high quality materials and craftsmanship. The 1990s marked incredible growth for Washburn. It also saw the inclusion of some outstanding guitar innovators in the Washburn family: Nuno Bettencourt, Dimebag Darrell, Roger Waters, Bootsy Collins and Jennifer Batten have the distinction of being some of the few artists ever to be honored with a Washburn signature model guitar. In the twenty-first century, Washburn is continuing to build its history. Now more than ever, an investment in a Washburn guitar is a special gift for yourself or someone you know. Some stories demand to be told. Others are simply content on being heard. Heard through music, through lyrics, through a cultural revolution. This is the story of Washburn Guitars. Steeped in the tradition of fine instrument making, Washburn Guitar’s dynamic 120-history began in Chicago in 1883. The original guitar factory was located just blocks away from Maxwell Street. In the early 1920s, Maxwell Street itself would emerge as the epicenter of a musical movement. Often considered the first entry point for thousands of African-Americans arriving from the Mississippi Delta, Maxwell Street became a hotbed for Delta Blues in its most raw and dramatic form. Newcomers and established musicians alike would listen and jam with one another in an atmosphere void of commercial influence. Once recorded, this powerful, emotional style of music would not only become the dominant form of blues but would radically change the emerging sound of rock and roll. There, on Maxwell Street, as well as in alleyways, city sidewalks, bars, and honky-tonks around the country, Washburn guitars were embraced as the very embodiment and reflective spirit of the hard-working musicians who played them as well as the employees who designed and crafted them. It is the same spirit that guides Washburn to this day. The history of Washburn Guitars is the history of a wide range of musicians. From blues players who shaped rock â€˜n roll to multi-platinum recording artists to emerging guitar virtuosos. It is a history that can be heard and experienced every time you turn on the radio or listen to a live performance. It is a history built by skilled craftsmen and musicians who share one common love–a passion for the guitar.